Bring almond milk to a boil in a pot over high heat. Add quinoa flakes, return to a boil, and cook for 30 seconds, stirring frequently. Add vanilla, cinnamon, ginger, nutmeg, and prunes and cook another 30 seconds, continuing to stir. Remove from heat and allow to cool. Add maple syrup, mix well, and sprinkle with almonds. 1. 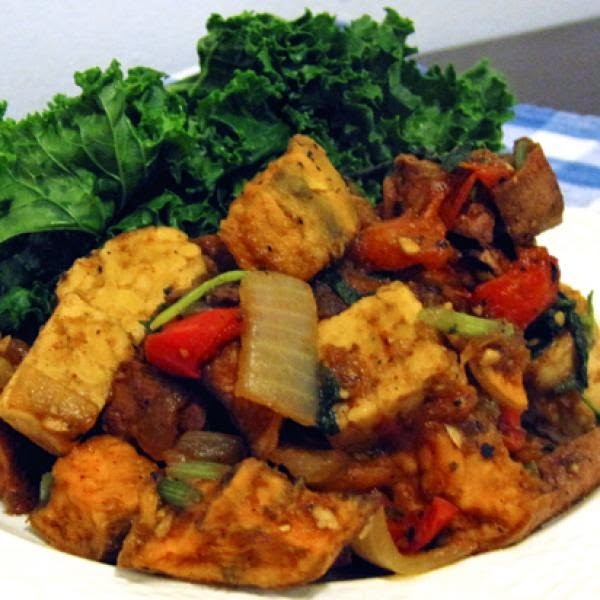 Drain tofu by placing it between two plates and setting a heavy pot cover on top of the top plate. Let sit for an hour, then blend tofu and maple syrup in a blender for about 30 seconds, until completely smooth. 2. Blend all pancake ingredients in a blender. Heat a nonstick skillet over medium-high heat and ladle in batter by the quarter cup. Cook until bubbles appear, then flip using a spatula, even out (or thin out) pancakes with the spatula, and cook for two to three more minutes. 3. 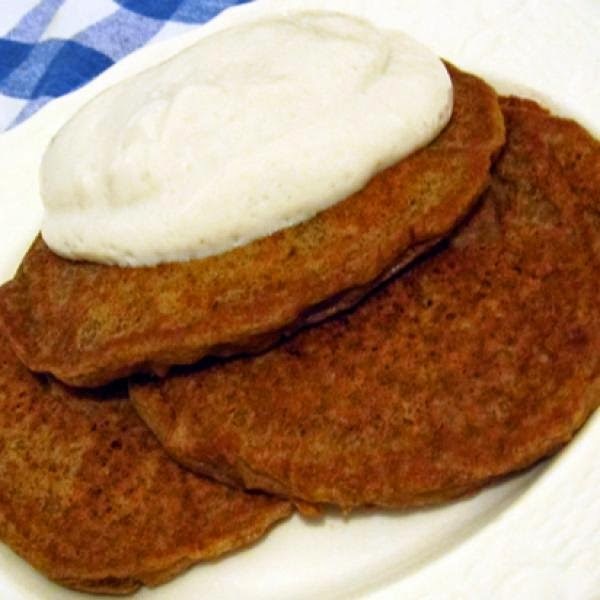 Top warm pancakes with tofu whip. 1. Heat the oven to 350 degrees. Place sweet potato in a lightly oiled or nonstick pan and bake for 20 minutes. Remove from the oven and set aside. 2. In a wok over medium-high heat, sauté onion and garlic in oil for 2 to 3 minutes. Add pepper, tempeh, and a bit of broth and stir frequently for 2 minutes. (Keep broth handy and always have 1/2 to 1 centimeter of broth at the bottom of the wok.) Add sweet potatoes and paprika, and slowly add remaining broth until it has all been absorbed by the tempeh and potatoes. Then add soy sauce, salt, pepper, and parsley. Mix well and serve. 1. Preheat the oven to 400 degrees and line a cupcake tin with wrappers or oil the tin well. 2. Mix flaxseed and water well, then beat with sugar and applesauce in a large bowl with an electric mixer until well combined. Add flour, baking soda, cinnamon, ginger, and salt and beat. 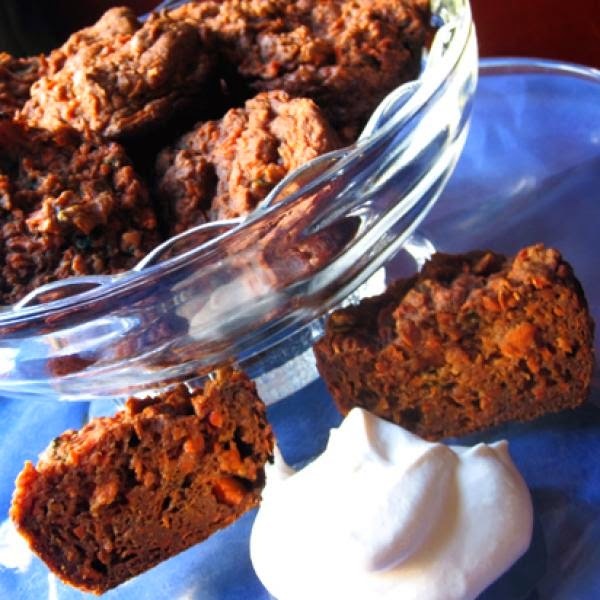 When well blended, stir in carrots and, if desired, pecans and raisins. 3. Spoon batter into cupcake tin and bake for 25 to 30 minutes, until golden brown on the edges. Remove from the oven and let cool on a rack for 15 minutes. Remove muffins from the tin and let cool on rack completely. 4. Beat cream cheese and margarine in a large bowl until smooth. Add maple syrup and vanilla and beat again until smooth. If spread isn’t sweet enough for your liking, add up to 1/2 cup sweetener of choice and beat until smooth. Refrigerate for 1 hour. 5. Serve muffins with cream cheese spread on the side. 1. Drain tofu by placing it between two plates and placing a heavy pot cover on top of the top plate. Let sit for at least an hour. 2. In a nonstick pan over medium heat, lightly brown garlic and onion, stirring frequently. 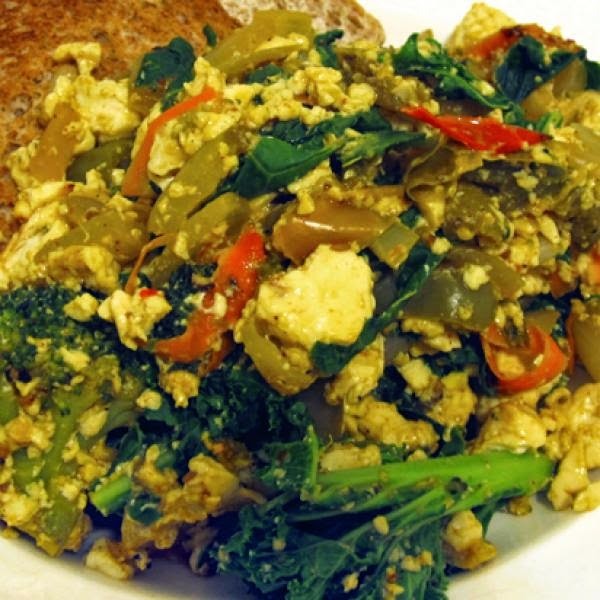 Crumble tofu into pan and add remaining ingredients except kale. Stir frequently, until tofu reaches desired color, about 3 minutes. (If mixture becomes too dry at any point, add water 1 tablespoon at a time.) Reduce heat to low, add kale, and stir for 1 more minute. Serve with vegan toast and tempeh bacon, if desired. 1. Place all nut butter ingredients in the top of a double boiler and stir until melted and mixed well. (If you don’t have a double boiler, place a stainless-steel bowl on top of a pot of boiling water so that the bowl rests in the water but doesn’t touch the bottom of the pot, and melt the ingredients in the bowl.) Let mixture cool in the refrigerator for at least an hour. 2. 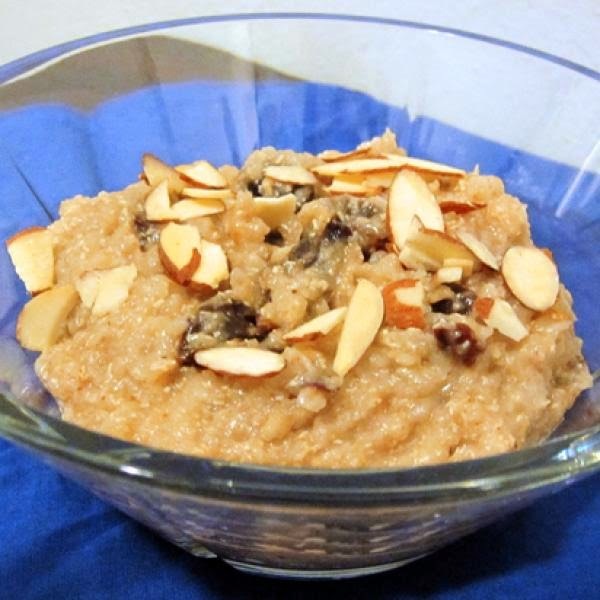 Blend banana, almond milk, maple syrup, cinnamon, and vanilla in a blender and pour mixture into a shallow plate. Soak bread in mixture for 1 minute, flip, and soak another minute. Add margarine to a skillet over medium heat and rotate pan so bottom is lightly coated. Add bread and cook 2 to 3 minutes on each side, until lightly browned. 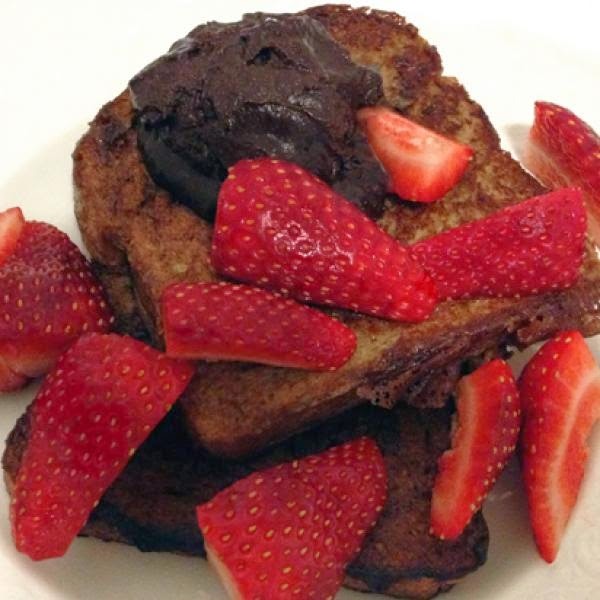 To serve, top two slices of bread with a dollop of chocolate nut butter and fruit and nuts, if you like.